Pheasants belong to the Phasianidae. They have colorful and gorgeous feathers, and they are one of the rare species particularly in China. 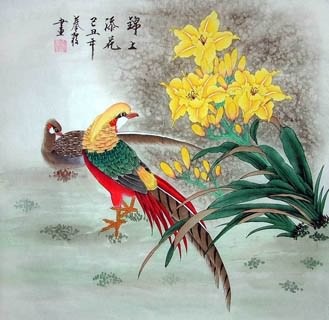 Chinese Pheasant Painting: Pheasant is called "jin ji( 锦鸡)" in Chinese, which wounds like "gold and auspiciousness(金吉)", so it has very auspicious meanings. 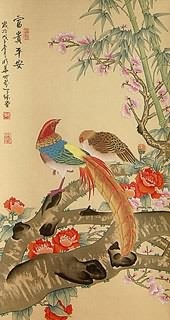 In ancient China, people believed pheasant to have the function of dispelling evil spirits, spo they often used pheasant designs as the decoration of clothes. 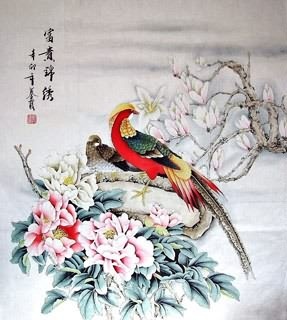 The pheasant design embroidered on the emperor's formal dress or civil officials' robes was called "hua chong(华虫)". It's a rank signs and represented authority and dignitary. 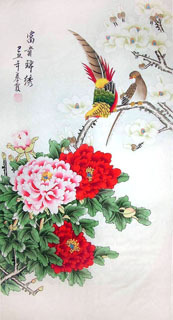 Chinese Plum Blossom or Peony & Pheasant Fengshui Painting: Jin Shang Tian Hua(锦上添花). 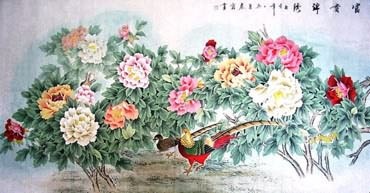 Pheasant is under a flower (the flower is often plum blossom or peony). Peony is a symbol of riches and honour. The combination is literally called "add flowers to the brocade", that means "to make perfection still more perfect", "a double portion of good fortune". 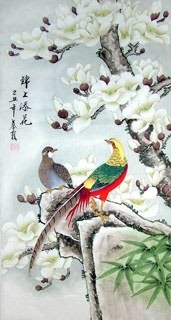 Chinese Magnolia & Pheasant Fengshui Painting: Jin Yu Man Tang(金玉满堂)/Yu Lou Jin Xiu(玉楼锦绣). 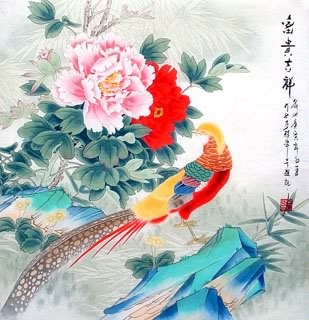 In Chinese, the first character of pheasant is "jin(锦)" which sounds like the word "gold(金 )", and that of magnolia is "jade(玉)", these two characters constitute the word "jin yu(金玉)", so this combination symbolizes "Treasures fill the homeJin". 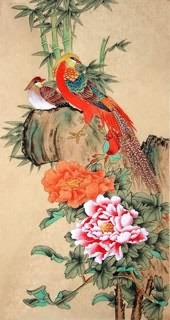 Chinese Pheasant & Laurustinus Painting: Jin Xiu Qian Cheng(锦绣前程). 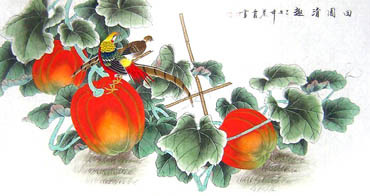 In Chinese, the first character of pheasant is "jin(锦)", and that of laurustinus is "xiu(绣)", these two characters constitute the word "jin xiu(锦绣)" which means bright. So this combination expresses the good wishes for the bright prospect and glorious future. InkDance Price: USD 515 /GBP 423 /EUR 490 Sold, you can customize it. InkDance Price: USD 525 /GBP 431 /EUR 499 Sold, you can customize it. InkDance Price: USD 507 /GBP 416 /EUR 482 Sold, you can customize it. InkDance Price: USD 475 /GBP 390 /EUR 452 Sold, you can customize it.